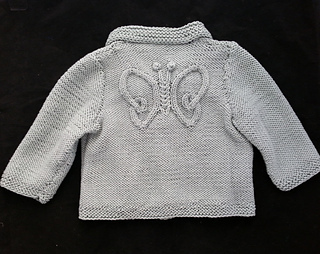 Knit this jacket for a special little one in your life! 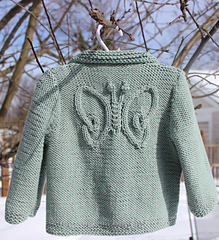 The back features a knitted-in butterfly motif created completely out of cabled stitches. With a button front and adorable collar, this garment will be a huge hit at any baby shower. It is sized for 6 months, 12 months, 18 months, and 24 months babies, and the butterfly motif could easily be used to make squares sewn together to make a matching baby blanket. Pattern includes detailed instructions and illustrations for all pertinent knitting techniques.